A global provider of hyper-scale cloud services, OVH needed to analyze users’ interactions on its site and derive insights from their behavior to inform product and ops teams. But OVH ran into a problem – its dashboards were too slow and didn’t combine different data sources for a complete view. In other words, they had the data, but couldn’t use it properly. 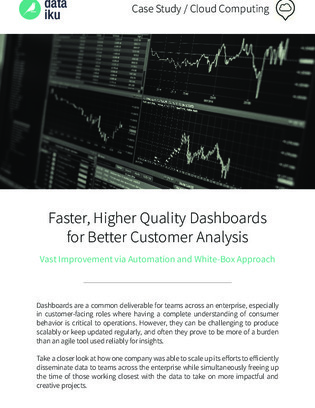 What they needed was a quality and efficient dashboard for their customer facing employees. Read this case study to learn how OVH leveraged Dataiku’s Data Science Studio to slash data preparation time and ensure visibility into the data life cycle, and improve data scientists’ efficiency by 40%.